Zoiks! Online - The Very Best in Stand-Up And Music! : Album Review: Wise Girl’s ‘You’ll Just Have To Wait. 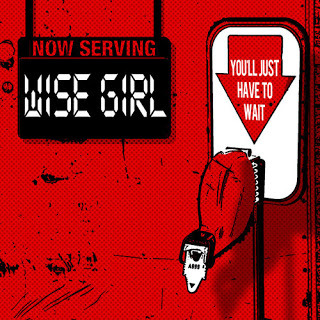 Album Review: Wise Girl’s ‘You’ll Just Have To Wait. Wise Girl’s debut album, “You’ll Just Have To Wait,” is both smart and fun. The three member band, fronted by Abby Weitz and joined by Chris Fasulo (guitar) and Harry Keithline (drums), brings a nice collection of catchy pop melodies and idiosyncratic lyrics. What’s great about the album is it seems like the band is having all the fun in the world. But don’t let their upbeat demeanor take away from how good their music is. The songs are tight and well-orchestrated and the lyrics are both honest and personal. As the album progresses, the music slightly goes from pop rock to pop country and back again, with “Little White Lies” and “I’m Not Ready” leading the way, and then returning to its original intent with “Stuck In This.” It’s almost as if Wise Girl does this on purpose, based on the mood Weitz was in while writing lyrics. There’s something really fantastic with this band and I can’t wait to see what is in store for them in the future. Jason Tanamor is the Editor of Zoiks! Online. He also is the author of the novels, The Extraordinary Life of Shady Gray, Hello Lesbian! and Anonymous. Visit him at www.tanamor.com. Email him at jason@zoiksonline.com.